In the event of an emergency, the links below can serve as a quick reference for different types of emergencies. However, we highly recommend you review the information before an emergency occurs, in order to increase your preparedness. If you are unsure what to do in an emergency, always follow the instructions of Institute and emergency personnel. Call 911 (calls go to the Massachusetts State Police then are rerouted to the local jurisdiction). 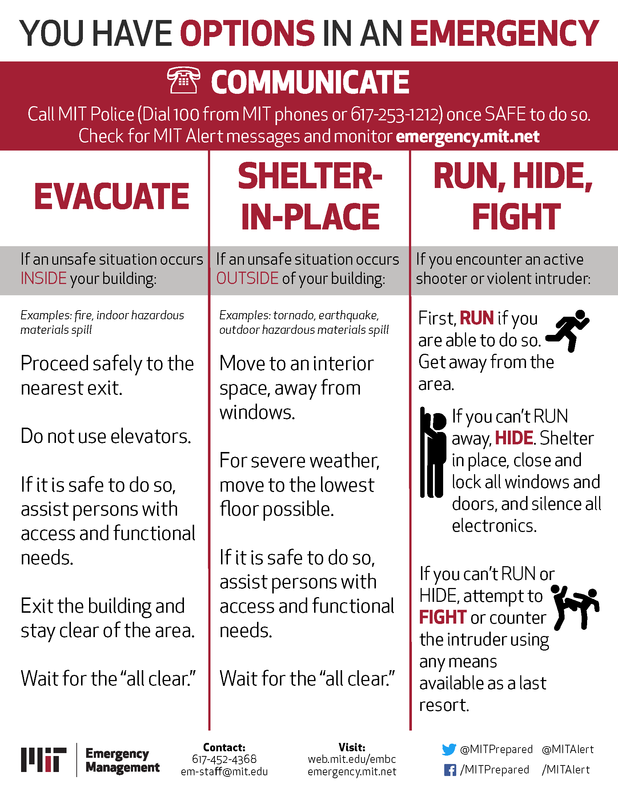 When appropriate, the MIT Alert emergency notification system will send electronic messages (text, email, voice, etc.) to our registered community members and various static devices (office phones, digital displays, etc.). To register yourself, update your information, and to find out more, please visit this page. Emergency Info Phone Line: 617-253-7669 (or 617-253-SNOW). This is a recorded message. Please utilize these emergency contacts and similar services (mental health, physical security, etc.) that may be needed during or after an emergency.